I spent the last 5 days at my parents beach house in Sandbridge. The house I grew up in. It's quiet there. The open windows let in a cool breeze. Salty air calms the nerves. Always there's the sound of not-so-distant waves crashing with a lulling woosh-a-woosh-a. When the wind picks up, you'll hear the ringing and clinking of lazy wind-chimes on every front porch. Electric green hummingbirds dive in the front yard, looking for flowers, settling then jetting off. Dragonflies amble. They're large and shiny like mother-of-pearl. They seem heavy and barely capable of flight in the end-of-Summer sunshine. Yellow and black striped spiders weave intricate knots all over the waving bay and juniper bushes. I have so many memories here. It's surreal, this place. I walk along the grassy pathway towards the beach, lined with passionflower and bramble rose and prickly pear. I remember being 12 years old, rather awkwardly proportioned with long dirty blonde hair. Carrying a large pink plastic inner tube over my head like an oversized neck pillow. My brother, with unruly straight brown hair and laughing eyes, beside me. Barefoot and squinting against the electric noon sun. It's the same here but also different. The streets are just as long. The air still smells like salt and bay leaves and sweet water and pine. The local beach market is untouched, if not slightly worse for the wear -- still selling $1 doughnuts and cellophane-wrapped fried chicken. But now the trees are taller. The beach entrances are manicured. There are more mega mansions and fewer cobbled-together beach shacks. Where the junky arcade used to be, there's a white, concrete condominium. But one thing never changes. A walk along the beach is the same as it ever was. Broken shells are strewn about. Impossibly tan families sun-bathe, their golden toddlers waddling about with blue pails full of water. Surfers of all ilk bob in the soft waves. 30 feet from shore, a pod of dolphins breaks the ocean surface with curving fins. The sunsets are still grapefruit and strawberry sorbet. Now that I'm home, settling back into real life, I'm craving grounding rituals and foods. Anything to get my brain back in the game after my vacation reverie. I'm back in the gym, expressing through sweat... and dancing a little too hard on the elliptical. I'm getting into meal prep, so I can have pulses and grains around all the time. 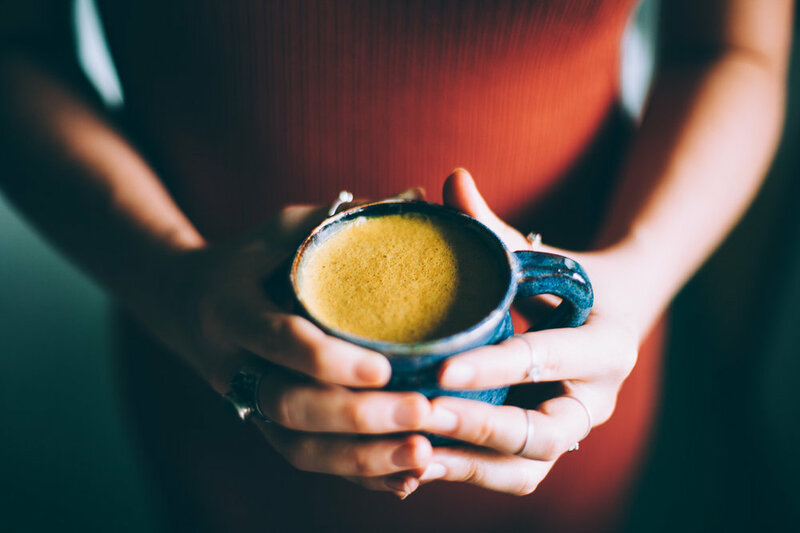 But, more than anything, I'm craving my Golden Milk Mocha, made with coconut oil, strong brewed coffee, cocoa, turmeric, dates and cinnamon. It's the beginning of September, and albeit the heat that's lingering here in the mountains, it's clearly a season of transitions. Time to shake off those warm-weather inclinations and prep for some majorly cozy vibes ahead. In many ways, this Golden Milk Mocha is a farewell to Summer energy. An elixir to beckon in the blue light and cool air of Autumn. 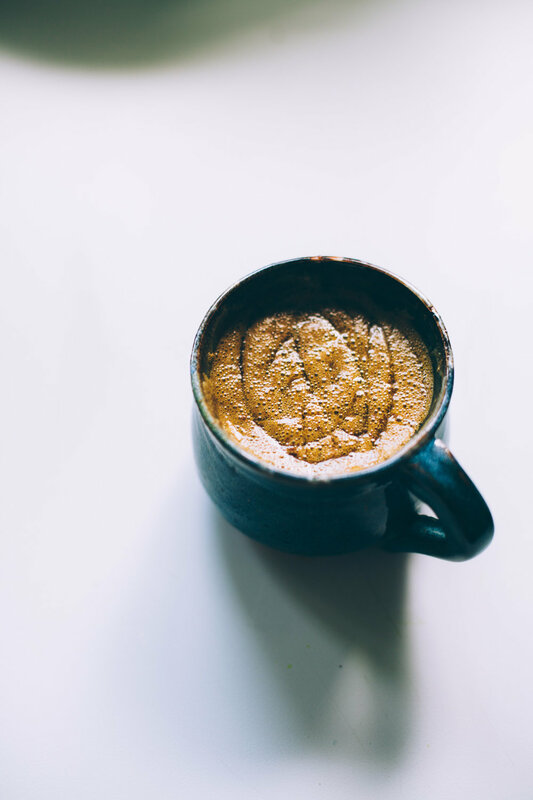 This Vegan Golden Milk Mocha is grounding and nourishing. It's mildly sweet and creamy. It's basically a cross between a mocha and a dirty chai -- with the addition of woodsy, warming turmeric. Our anti-inflammitory, super herb ally! Note: When you blend coconut oil with hot liquids it emulsifies and creates a cap of foam on your drink. That's why it looks a lot like a latte when you pour it into your mug. 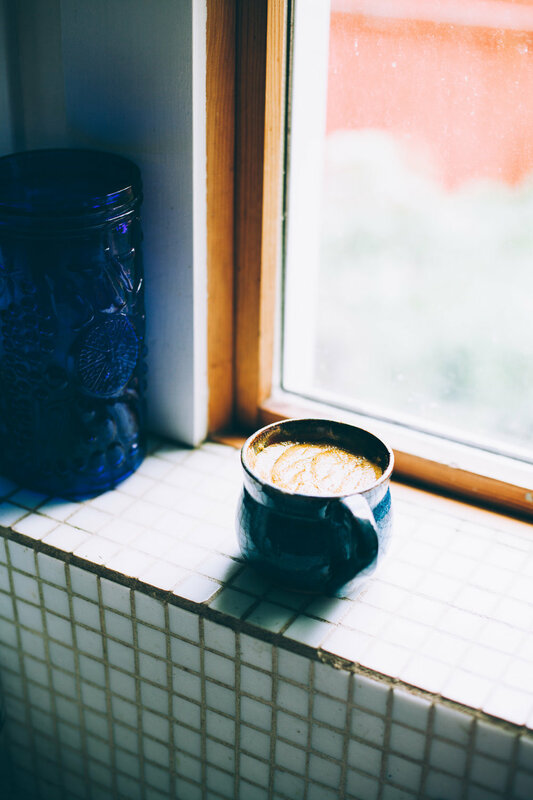 If you don't have a high powered blender, you can make this latte with an immersion blender! I often do, for the sake of convenience. Thanks to Free People for providing the dress and midi-rings I wore in this post. Find their whole collection here. Thank you to The Farmhouse for the use of their space for this shoot. Thanks to Lauren Stonestreet for taking the shots of me holding the mocha! For the coffee: I usually do Chemex or pour-over method, a ratio of 20 grams ground coffee to 360 grams hot water. French press is also appropriate. // I also add a drizzle of honey to the top, occasionally, but that’s more for aesthetic purposes than anything. Add all of your ingredients to the bowl of a high powered blender. Blend until all of the dates are completely emulsified, about 30 seconds.